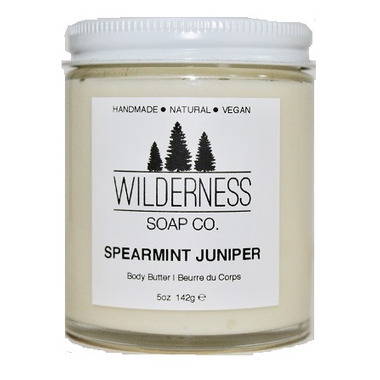 View all products by Wilderness Soap Co.
Wilderness Soap Co. Spearmint & Juniper Body Butter will be sure to lift your spirits on the chilliest of winter days and leave your skin feeling refreshed and soothed during the hot summer months! This is a butter created for year round hydration. Ingredients: Butyrospermum Parkii (Shea) Butter, Cocos Nucifera (Coconut) Oil, Prunus Amygdalus Dulcis (Sweet Almond) Oil, Arrowroot, Macadamia Ternifolia (Macadamia Nut) Seed Oil, Tocopherol (Vitamin E), Mentha Spicata (Spearmint) Leaf Oil, Juniperus Communis (Juniper Berry) Fruit Oil. Contains Nuts.